When you set kids in front of a piece of technology, there’s a good chance they can figure out how to use it. However, as it is with most things, they won’t understand why it works. It’s easy to figure out what to click, which buttons mean what, and how to turn a computer on and off, but for most people that’s where their knowledge ends. The vast majority of people don’t know the internal workings of a computer, what to do when it’s broken, or what’s hiding on the inside. 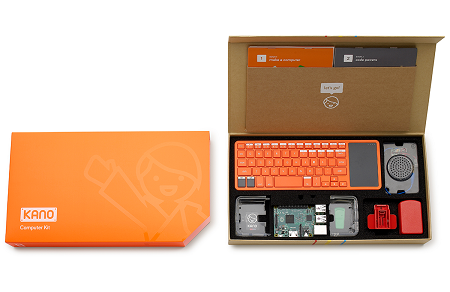 If you want your kids to know more than just how to navigate email and the Internet, then you’ll need to either teach them yourself, or let them figure it out for themselves with Kano. This is a kit that will let the user build and code their very own computer through games, stories, and pictures that will guide them through the whole process. The premise is to learn through play. Inside the kit is Raspberry Pi 2 which has a 900mHz quad-core Arm Cortex-A7 and a 1GB ram. It also has a DIY speaker which you will have to figure out how to plug in, an SD card pre-loaded with the OS, a case, stickers, a WiFi dongle, cables, and a keyboard with an integrated touchpad. This is going to cost you around $149.99, and takes the game approach where you can level up as you complete more and more. You will need to have a monitor handy, but this would be a great educational tool. If you know nothing about computers, this might be a good way to start learning.